Kelsey's brother was engaged last year. As soon as Bree's wedding quilt was gifted, we agreed that we would make another joint quilt for Kelsey's brother and his new wife. Predictably, months passed, we got busy with other things and we never actually took the time to plan anything . In about March of this year, I asked Kelsey whether she thought we still had time. A few text messages later we had a plan. 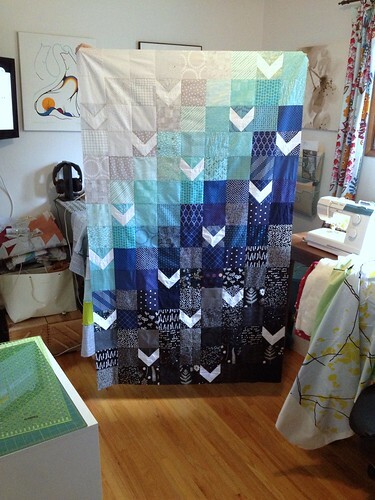 We had agreed that blue was a good choice and that it would make sense to keep the quilt mostly monochromatic, moving from white to black through shades of grey, aqua, teal and navy. 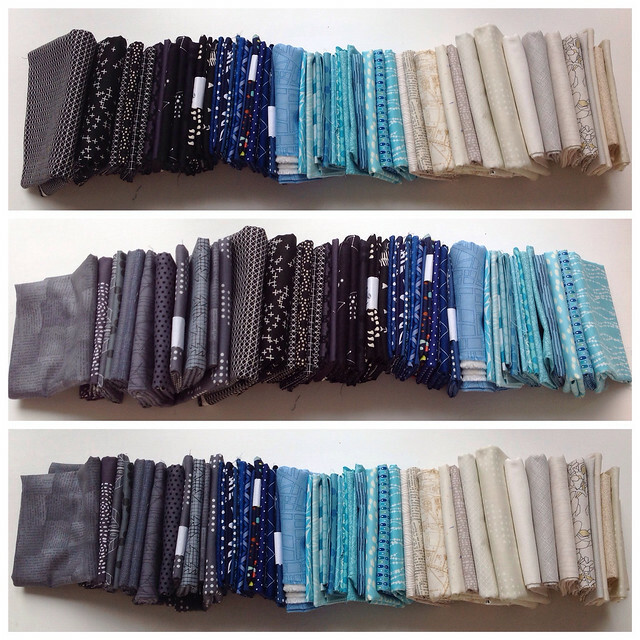 Kelsey pulled three different fabric stacks from her stash to find a range that had the feel we were looking for. The first selection ended up being the winner since it had the most contrast while still shifting nicely between the different colours. 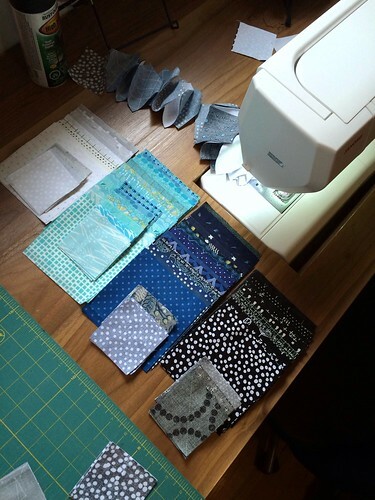 Since I was mid-move, she Kelsey cut all of the fabrics into squares and grouped them by colour family before popping them in the mail with her half of the quilt and some short instructions scrawled onto a scrap of paper. A nerve wracking week later, the fabric arrived and I got my half of the quilt laid-out and sewn together before sending it off to be long-armed by Sarah of Crinklelove. The quilt came back from Sarah a few days before we left for the wedding. I happened upon the same fabric I used to bind my White Star quilt while digging through the stash and decided that it would be perfect. It took me a cab ride, two flights, a pub lunch, the tail end of a late-night Harry Potter movie and the drive to the wedding to get the binding stitched down and a label attached. Luckily, the quilt got done on time and I even managed to talk the Mr. into holding up the quilt for a few quick photos on the way to the ceremony. Nothing like a few seconds to spare! I would have been a wreck cutting that so close. It's really a beautiful piece, and something to be proud of. Dd and I really love your color gradation. It works! 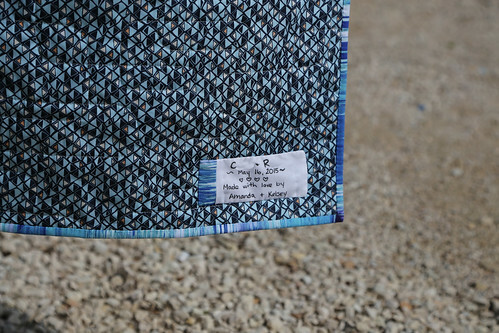 Great fabric selection! Nothing like getting it done just in time! Great finish. What a gorgeous finish, and just in the nick of time! I'm sure they were thrilled, and your teamwork is so admirable! Love it!